When the same IT company CCC that installed the computer at Bill’s school had a serious bug with its protection system, they remembered about the young hackers from the middle school. They approached Bill and his friends to find security holes in the system and as a reward, the teenagers were promised endless computer time. This offer could not be resisted: as a result, Bill wrote a payroll program and in exchange, he could hang out in the computer lab for days and nights. 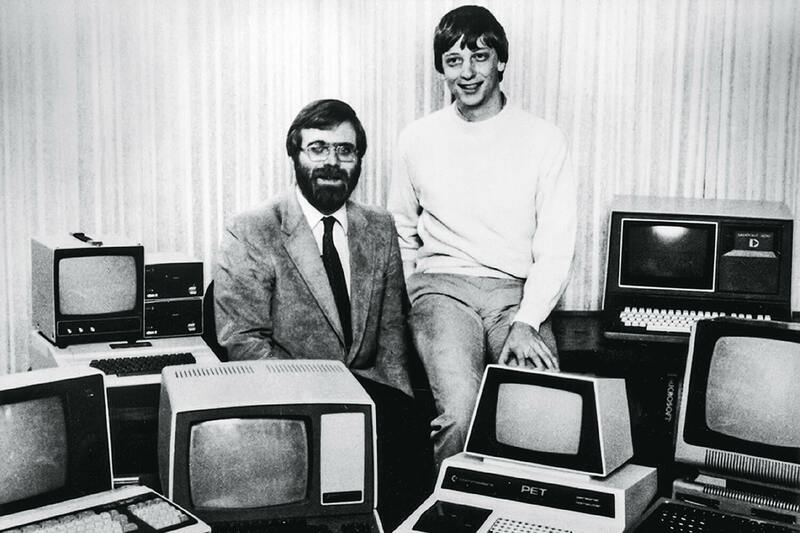 From then on young hackers continued to receive regular software development orders and Bill Gates was the first one to acknowledge the potential commercial benefit of creating a company. Together with his school friend Paul Allen, tFrom an early age, Bill Gates demonstrated a strong aptitude for maths, scoring maximum 800 in the maths part of the intelligence test and therefore winning the title of the smartest kid at school. The world of computers captivated all his attention and when the director of his school purchased a computer, young Bill spent all his time in the lab together with his friends. It was an era of teletype machines and he was learning what interesting things such a machine could do. Young programmers found very quickly weaknesses of the machine and managed to break the computer defence system. They would go on to change the files that registered computer record times so that they could stay longer in the lab. Bill went even further and developed a program for scheduling classes so that he could turn up with the prettiest girls in the same class! They started a venture called Traf-O-Data when they optimized the road traffic by writing a program for the Intel processor of traffic counters. They sold it for $20,000 at just 15 years old! Other notable moments of his early life include being enlisted as a National Merit Scholar with SAT exams results of 1590 out of 1600. The era of his first business venture came to an end when he graduated from college and enrolled at Harvard Law School to meet the expectations of his family. Bill did not have a study plan for Harvard and took standard freshman classes together with Harvard toughest mathematics course. He would spend most of the night working in the computer lab and would catch up on sleep during the classes. He remained in close contact with his best friend Paul Allen even after leaving school and they would often discuss potential project ventures and consider starting a company together in the future. At the end of the first year at Harvard, Bill made up his mind to open a software company and to drop out of the University. In 1975 Gates proposed to the creators of the new microcomputer Altair 8800 his BASIC interpreter for their platform. In fact, he and his friend Allen did not write any code but they had an idea how to do it and wanted to attract their interest. After signing the deal with the president of the company, Paul Allen and Bill Gates named their partnership Micro-Soft and a year later they decided to drop the hyphen and registered their new company under the name Microsoft. Later it was IBM who approached Microsoft to develop the BASIC interpreter for their new PC as well. Gates became an exclusive licensing agent of the 86-DOS software as well as the full owner of it later, pocketing $50,000 for the deal. The same year he came up with the vision for his company: “to provide a computer on every desk and Microsoft software on every computer”. The sales of this new software quickly made Microsoft a major player in the computer industry with Bill Gates becoming the president and the board chairman of Microsoft after the company restructuring. 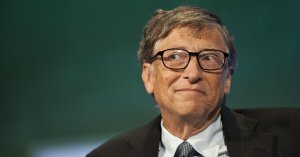 Thirty years later we can see that Bill Gates has succeeded in turning his vision into reality and that indeed every desk at home, work and educational institution have a computer with Microsoft software installed on it. Today Microsoft is one of the innovation leaders in the software industry which is why they dominate the market as the #1 company in the world. 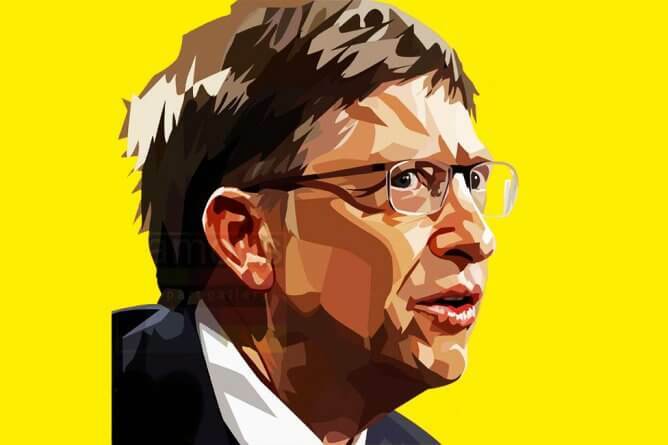 As the CEO of Microsoft, Bill Gates was named numerous times the richest man living on the planet. In 2000 he chose to step down as the CEO to become the Technology Advisor to the new CEO Satya Nadella. By undertaking a less demanding role at Microsoft, he could focus more on his charity work in Melinda & Bill Gates Foundation. 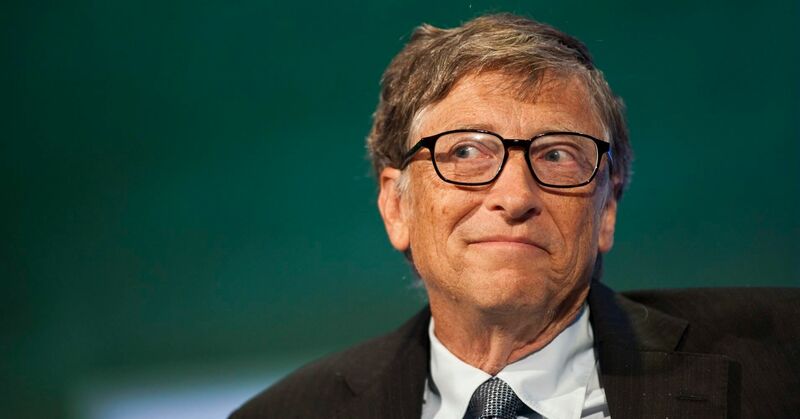 Having been inspired in his college times by the philanthropic work of Andrew Carnegie and John Rockefeller, Bill Gates decided to leave only $10 million out of his 95€ billion wealth to each of his three kids and to dedicate the rest to the charity causes. 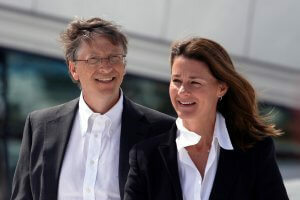 In 2000 together with his wife Melinda they merged 3 family charity funds to create Bill & Melinda Gates Foundation. As of 2018, they are the most generous philanthropists in America, having given over $38 billion to fund projects in global health, education, poverty and emergency relief after climatic cataclysms. After visiting Africa for vacation for the first time in 1993, Bill and Melinda saw deep poverty and children dying from illnesses that no one in America died from. They learnt that every year the infection Rotavirus killed half a million kids in that region. At the beginning, they thought that there would be massive worldwide support for Africa to save all these poor children but very soon the couple realised that they were wrong. Although the private sector was able to satisfy the needs of those people who were able to pay for it, there were millions of Africans who had no access to such services. The Gates couple realised that there was a need for strategic and systematic aid with a thorough understanding of cultural and historical features of the African continent and this idea inspired subsequent charity projects of Melinda & Bill Gates Foundation. Around $2 billion of the fund’s money has been spent on malaria causes only. Their partnership with the mosquito engineering company Oxitec allowed funding an innovative project when the new breed of male mosquito was developed that would kill all the subsequent generations of the mosquito-bugs. Other projects include fighting Ebola in West Africa by sponsoring R&D of a low-cost polio vaccine with more than $38 million donations. Increasing the access to vaccines for the poorest countries in partnership with the GAVI Alliance has been one of the most effective collaborations of the foundation. Other initiatives of the foundation include advancing women opportunities through girls’ education in Africa and eliminating malnutrition in Nigeria, the largest country on the continent. In their foundation’s annual letter, Melinda and Bill Gates have expressed their hope that the world is gradually becoming a better place to live despite violence and political turbulence. The key drivers to Bill Gates’ success story is his ability to concentrate and his very high capacity for hard work. This allowed him to score “10,000 hours of deep work” that distinguish professionals from amateurs early on in his career – even before reaching 20! Even though Bill Gates entered Harvard with no clear idea about what he wanted to do, he was already a highly skilled IT professional. It is due to his passion for computers which he discovered at a young age and support he got from his school teachers that let him discover his talent to the fullest. Bill Gates is a visionary person who had a clear vision for his business venture and who was able to convince other people to believe in his products as well. He believed in himself, in his product and in his collaborators and he worked hard to make it work. He is an avid reader and started his own blog gatesnotes where he recommends the books he liked – there are over 150 titles so far. He thinks that reading is an important tool of self-education and it is one of the most important traits of successful people who develop continuously and learn something new every day. Also, Bill Gates is an avid communicator who successfully created partnerships throughout his life and hired talented employees who helped him grow the company on a worldwide scale and later to dedicate his time to charity work. Help others – is one of the most important postulates for Bill Gates. According to his own words, work for Melinda & Bill Gates foundation is the most satisfying thing he has ever done in his life. Here you can listen about the charity work of their foundation in his own words. Categories: Uncategorized Tags: best buyback deals, best venue for selling books, BillGates, BillGatesStory, billionairemindset, booksrun, BooksRun tips, business textbooks, buy textbooks, buy used textbooks, entrepreneur, inspirationalquotes, motivation, rent textbooks, sell textbooks, Story, strategy, success story, successful habits, successful strategies, Tags: best BooksRun deals, textbooks for buyback, warrenbuffet, What Can We Learn from Bill Gates’ Story Author: Dana M.